when Hurricane Andrew blew through. Much of the island was evacuated. But not me. Couldn’t get on a flight. So I rode it out. Today, it has changed so much. Many tourists, shops, bars and restaurants. I’m not one much for crowds. I’ll take you on a little tour. And I'll even throw in a few of these guys! Cause I'm that kind of girl. That first shot is gorgeous! Cool, thanks for sharing, I'm looking forward to more!! I'm with Ashley and Texwisgirl, that first one is stunning. Wow.. what a beauty of a sunset. Your first picture is stunningly beautiful! I remember Andrew, my brother-in-law's house was damaged. What an awesome capture, Reena! What a glorious way to end --- or begin! a day! Really breathtaking! And, of course, I love the bird! Look forward to more!! Hope you're having a great time! Enjoy! Such a gorgeous sunset to welcome you to Key West! Enjoy! gorgeous photos!!! i must admit my only foray to florida was long boat key up near sarasota. If the upcoming pictures of Key West is anything like these, bring it on. the sun knew you were coming, the birds must have heard as well!! i think your header has changed as well, it is breathtaking. i wish i knew how to do all the wonderful things you do here!! I love your tours! Looking forward to seeing more. I'm jumping on the tour bus. Wait for me! I could use some of that warm sun! I'm with you my friend! Bring it on! Your headed changes are lovely too. I agree with everyone else. Love your travel shots and the second photo is awe inspiring. I'm looking forward to seeing more. Stunning!!!! 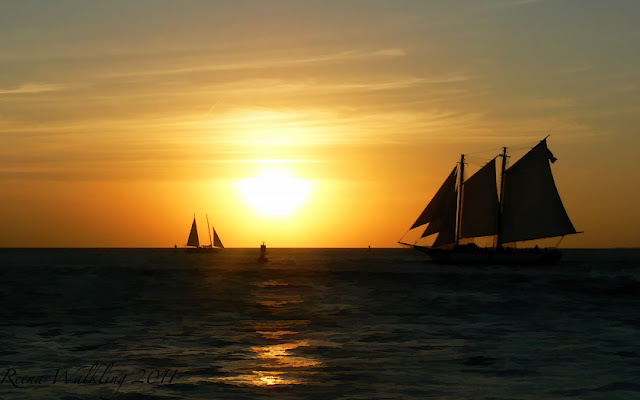 Key West is a place that I haven't been and want to go. We will be hopping a plane on Friday morning, landing in Ft. Lauderdale, and driving to spend the week in Key West. I'm so excited, I can barely contain myself!! I always feel like I am on vacation with you when you show us your pictures. Enjoy the warmth!! I love traveling with you. We visited Key West once over 30 yrs ago .. drove down from my parents place outside of Boca and when we got there .. well there were no inexpensive hotel/motel rooms to be had so we stayed at a pricy place overnight and in the morning drove around sightseeing before heading back to Boca .. I need another visit for sure ..
Wow love that bird shot so focused. The sunset with the sailboat silhouettes is amazing. Can't wait to see more! What a way to celebrate your 40th birthday. Such lovely photos. I have never been to Key West.. I would LOVE to go someday! We do most of our traveling over here in the west for know!! Am not one much for crowds either. I was there once..., more than 15 years ago. I remember it to be pretty touristy. Look forward to see more!! Can't wait for the photo tour! That sailboat silhouette photo is magazine worthy! You should submit it to some FL magazines! wow, nothing beats a beautiful sunset! Such gorgeous shots, the first one is breathtaking. Love, love, love your pics! These are such wonderful shots, Reena! Trust me to have a Hurricane named after me lol.. I have visited Miami but never manged to reach the Keys... I would love to do the drive over the causeways. Is Hemmingway still a big attraction and do his 28 toed cats still survive in Key West. looking forward to having you show us around. The color in that first shot is so gorgeous! I've always wanted to go to Key West, but only got as far as Miami (ironically, soon after Andrew's visit! I'm very impressed you rode it out!) I'm going to enjoy your tour! that first shot is absolutely wonderful! all your photos make me wish I was sitting there too! I haven't been to Key West in way too many years. The first picture is stunning. The light and composition are perfect. A very beautiful picture. Wonderful photo work. Sigh- that first shot - so mesmerizing and gorgeous! Enjoy your trip. I saw a documentary about haunted places in Key West & they said something about the name means 'Island of Bones' - When that part of Florida was settled, they found lots of bones on the beach where someone had killed a tribe of Indians, but I can't remember who it was... I wish my memory was better!!! Reena, this looks like Heaven to me!! What a sunset! Wish I knew how to sail! Serve up the mojitos and bring on the tour! I've never been to Key West. Thank you for taking me along on your trip. I feel better now. Cheers!! Both are very nice pics, but that first one is amazing! I love that first shot, just beautiful. 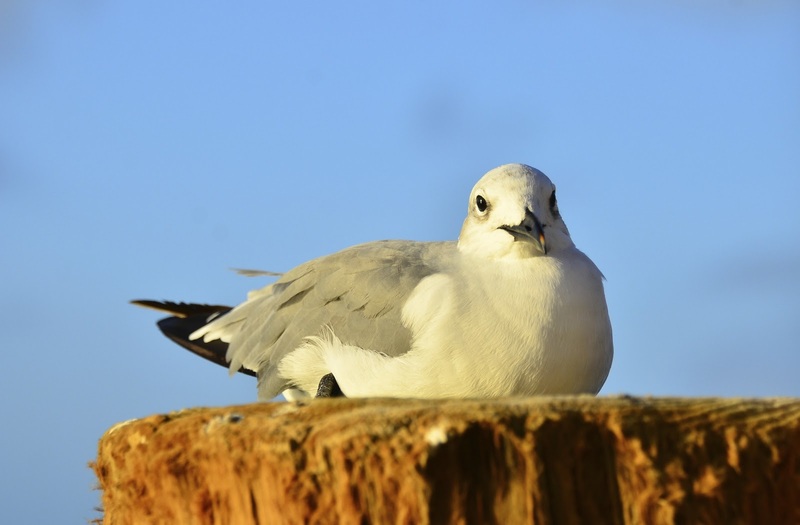 The gull is cute too. Wonderful photos.